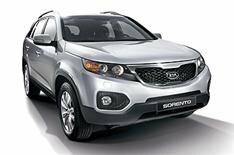 Kia unveils new Sorento | What Car? This is Kia's all-new Sorento, which promises to be more stylish, more practical and better to drive. The car's sleek new styling is radically different to the current model's boxy look and this is emphasised by a body that's 10cm longer and 2cm lower. There's an equally major change under the skin, because the new car has a one-piece body, in contrast to the current Sorento's separate frame chassis. That ought to make the new model more responsive on the road, and Kia has admitted that it wanted to 'improve the on-road driving experience, while retaining the vast majority of the previous model's off-road abilities'. Kia says that front- and four-wheel drive models will be built, but it hasn't confirmed whether both versions will be available in the UK. Hill-start assist and hill-descent systems will be available, and stability control is likely to be fitted as standard. The Sorento will also be available with seven seats for the first time and will have more passenger space. Kia also says that high-tech options such as keyless entry, a push button starter system, a reversing camera and a panoramic glass roof will be available either as standard or as options. The UK engine range has yet to be confirmed, but the options will be a four-cylinder 2.4-litre petrol, a 3.5-litre V6 petrol and a 2.2-litre four-cylinder diesel. Kia says that the most efficient version will have CO2 emissions of 173g/km.